I had the unusual fortune of being able to play games with 3 separate groups over the President’s Day holiday weekend. Definitely need more weekends like that one! 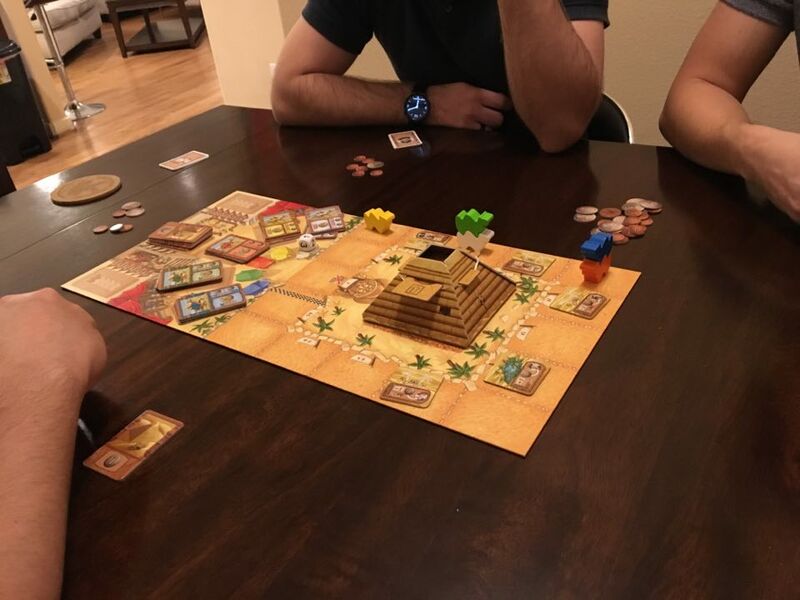 Saturday night I met up with my usual board game group and learned CamelUp (Camel Cup? The naming was a discussion point all night!). CamelUp won the Spiel Des Jahres in 2014 as Germany’s best Family Style Game. I can see why it won, but I wouldn’t want to play it very often. We played 3 games in a row to start the night and I was pretty tired of it after game 2. CamelUp is a dice rolling game about betting on camel racing. An interesting theme to be sure. There are 5 camels in different colors and ways to bet which one will come first during a leg (all dice rolled) and the eventual end of game winner (first camel to cross the finish line). Our games typically lasted 5 or 6 legs. The dice are rolled out of the pyramid. Next, I brought out my prototype for Zookeeper and we played 2 games. Omar meta-gamed the game pretty quickly by just calling out what number he was going after and making the rest of the table figure out if he was bluffing. I personally liked the strategy and he easily won both games. I thought it added an extra layer of deceit and second guessing. 4 out of 5 players had fun and we were all laughing and cursing when we got in each other’s way. 5 players might be a bit too chaotic, but more on Zookeeper later. Sunday morning I played some games with the family. 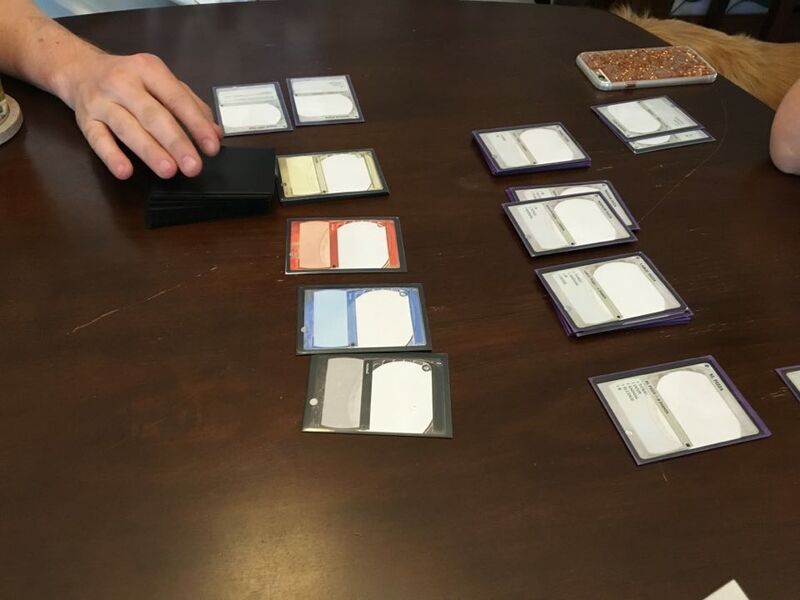 We cranked out another 10 rounds or so of Spyfall (see my previous post on Spyfall for my thoughts on this strange game) and then moved onto my pizza game prototype. The theme had evolved a bit to become trying to bake pizzas classic monsters (werewolves, vampires, mad scientists, ancient mummies, etc…) I wanted something different than other games that feature building or baking a pizza, and classic monsters is a theme I’ve always enjoyed. We played a couple of games and then started brainstorming ideas. One of the best ideas to come out of this was my brother-in-law’s suggestion of having a subtype of toppings that certain monsters couldn’t eat. You could never bake a pizza that had garlic on it for Vlad the vampire, for example. I really liked this suggestion and it opened up a lot of design space for adding new toppings. We played 1 game with unique player powers and one game without. The powers need to be tuned up and re-balanced, but I also got the idea of having each power be available in the game rather than arbitrarily starting with one. Instead of baking a pizza to get points, you could bake a pizza and feed it to a customer, claiming that customer and his special power for future turns. The more I play test this one solo and casually (tentatively named Transylvania Pizza Kitchen), the more excited I get. It could overtake Zookeeper as the project I focus the most on. I’m very keen to see how my new idea for unique powers works. 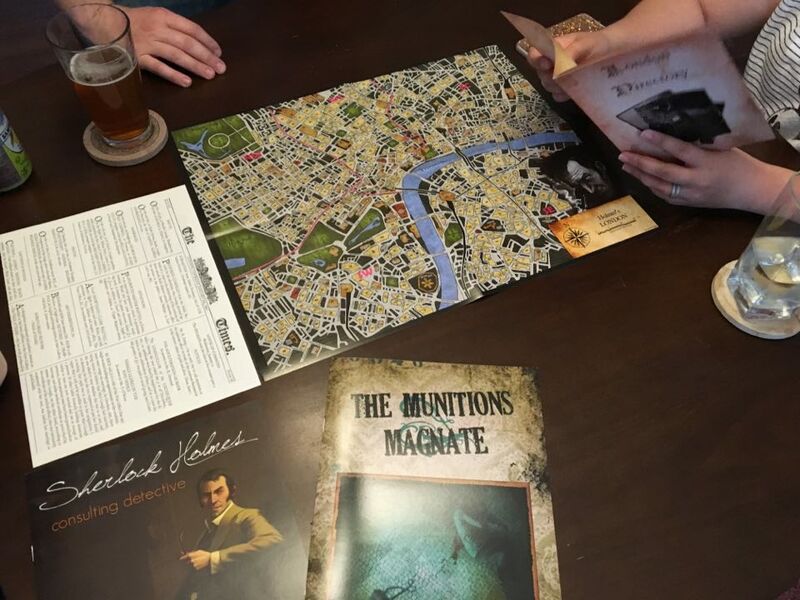 We ended the afternoon by attempting to play Sherlock Holmes:Consulting Detective. This game really intrigues me and I have been very eager to play it. In SHCD, you take on the role the Baker Street Irregulars and take a case off Sherlock’s hands so he can focus on more important matters. However, he doesn’t fully trust you and solves the case himself as well. You get points based on answering a couple of questions at the end of the case and lose points for each rabbit hole you went down. You might have an idea of what’s going on and attempt to solve the case after talking to 8 or 10 people, but Sherlock can hammer out the case details by only following up on 5 or 6 leads! I would rather focus on solving the case with my friends (or solo) than get caught up in how poorly I did compared to the master! You start with a map of London, an address book, the newspaper for the day, and the case book. The game comes with 10 case books, so you can essentially only play this game 10 times. I think that’s still a pretty good bargain for over 10 hours of thoughtful and engaging entertainment. You read the case introduction to all players, then decide what to do. It’s incredibly open ended. Should you check out the scene of the crime? Find a code in the directory then look that up in the case book and read aloud what unfolds. Care to check out the morgue, pay a visit to someone mentioned in the case intro, or go to the scene of the crime? Look up the matching place in the address book to get a location code, then use that location code to find and read a paragraph in the case book describing the scene. There could also be clues hidden in the news of the day. It’s a game version of a choose your own adventure story. The game is not without faults, sadly. It is almost too thematic…the case book is written in cursive in small print on a background designed to look like old parchment. This is a neat idea but makes it very hard to read in practice. The game also stays true to the time period and you will sometimes come across words you don’t understand or can’t pronounce. We played the first case for about 30 minutes after spending 10-15 learning how the game actually worked but decided to finish the case at a later date. It was a mistake to play this as the last game in the lineup. The mystery was starting to unfold and we had uncovered a list of potential suspects based on clues picked up during the investigation. I’m really excited to see how the game unfolds and how badly we get shown up by Sherlock in final scoring! I liked the concept so much I baked the Mythos Tales project on Kickstarter. It has very similar game play to Sherlock but uses the mysteries and horrors of H.P. Lovecraft as a backdrop. Who killed the Munitions Magnate? We’re not sure yet! 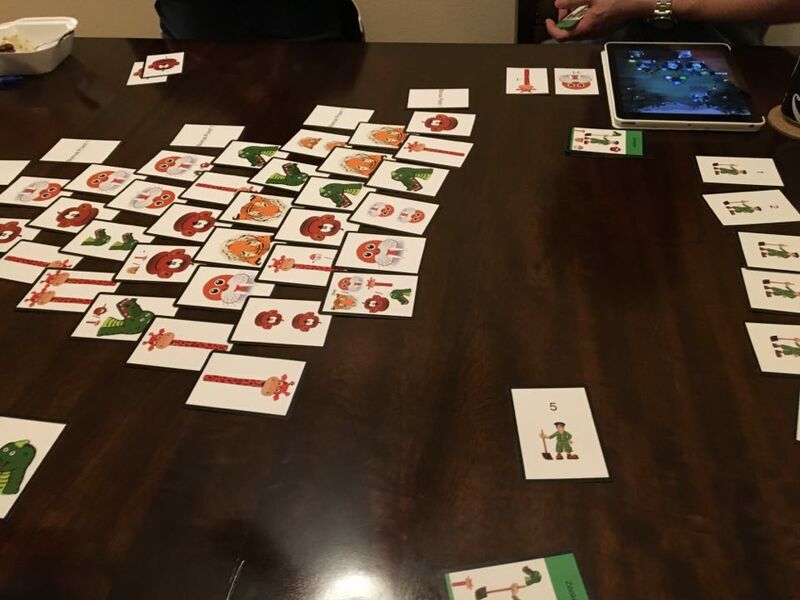 On Monday night I met with the Houston Board Games and Prototypes MeetUp group for the first time. I arrived a bit late and missed part of the first game being demoed, a game based on Antiques Roadshow. I tried to be helpful by giving my thoughts and feedback on the parts of the game that I witnessed. The theme and game play that I did see didn’t interest me too much. It had a bit of randomized set collection, a bit of take that, and a time track. 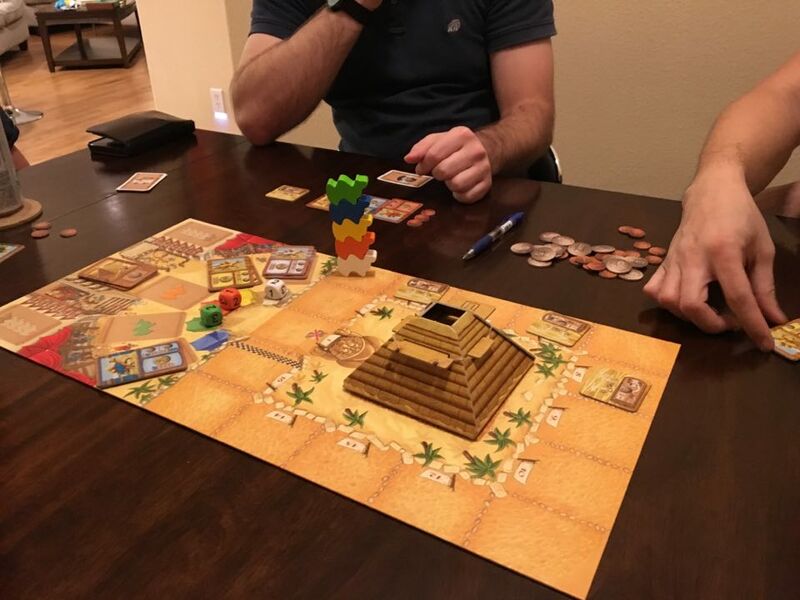 I do like the time track as a mechanic and Thebes is one of my favorite games. I’d like to see more games use this cool mechanic. I also learned that he has about a dozen games published by established board game companies and I hope he can be a fountain of inspiration and knowledge going forward. Up next, we discussed a prototype for an 18XX train style game. The designer described it as an 18XX game with the parts of 18XX that he didn’t like taken out. I’ve never played any 18XX so didn’t have a frame of reference, but some of the mechanics seemed pretty cool. We listened to him explain the rules and then asked questions and gave ideas back to him. He estimated the play time to be about 5 hours, so we just discussed different aspects of his mechanics. 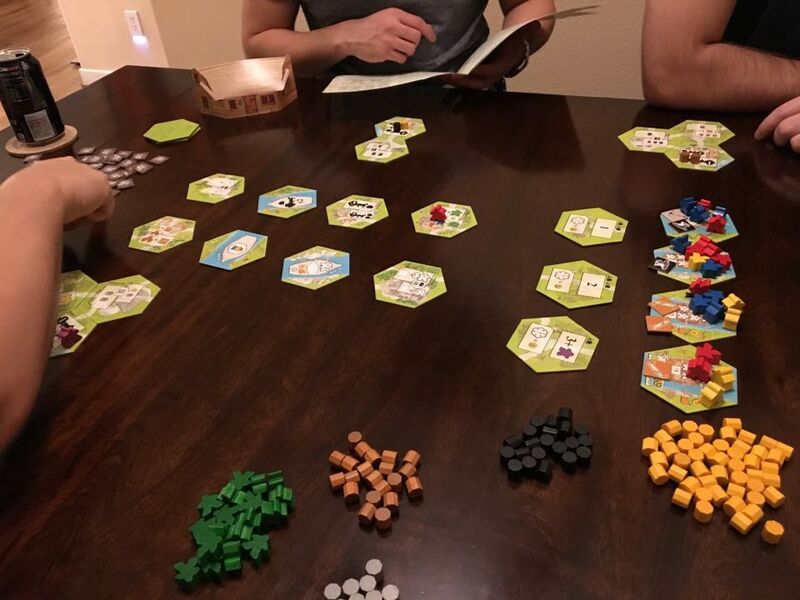 I could tell this was not the right group to play Zookeeper, based on game preferences and what had been showed so far, but I brought it out next and explained the rules and played through a quick 10 minute game. It got torn apart for being too random. Zookeeper is a game of outguessing your opponent. I think they missed some of that subtlety and likened the game to just rolling a 4 sided die every turn instead of making a decision. The published designer played completely randomly each turn and tied for first, so some of the criticisms have merit. The group gave me a lot to think about and some of the suggestions made sense and could be an improvement for the game. It was obvious that this level of gamer was not the target market for how the game currently plays. The feedback was brutal and no one liked the game, a stark contrast to playing it with more casual players. Still, all feedback is good at this stage and I’m interested to test out some of their suggested changes later. I don’t want to produce a product that is viewed as an inferior game by “serious gamers”.